When it became her turn, she gently asked the cashier for two packs of cigarettes to go along with her pack of gum. As a lifelong non-smoker, I became quickly curious as to how much one pack of cancer sticks costs so I spoke up and inquired. My mouth dropped open in my mind when the cashier quoted me the various prices. The day was January 2. I said nothing more as the woman who looked shamed grabbed her cigarettes and gum and left the store. By her defensive reaction, it was obvious she felt some guilt by smoking the life-threatening habit, padded by future self promises of quitting. Two days later, I was in a lab waiting for blood work. One of the only two technicians grabbed his winter coat and said, literally, that he ‘needed to fulfill his bad habit.’ Out the door he went, very well knowing what he about to do wasn’t good for him. Vice. Only vice. Why do some people think they are justified to having one when it affects one’s health and well-being? Allowed? Entitled? It is interesting. According to the Merriam-Webster dictionary, the definition of vice is a “bad or immoral behavior or habit.” Hmm. That doesn’t look it should be permitted or accepted to me. 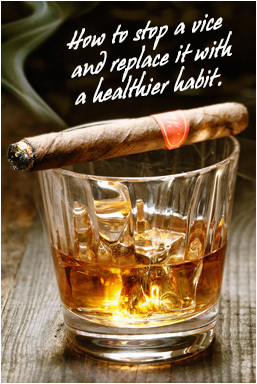 Perhaps vices are better classified as addictions? In a flip about, I have a vice, err addiction, to working out and eating healthy. It is the plague I am guilty of carrying and trying to spread. Goodness knows many have called me on it. But it brings me inner peace and rewards my inner being. If most people do have some type of self-proclaimed vice, then why not a healthy one? How about, ‘My vice is running’ which releases those high-catching endorphins. What about, ‘My vice is reading,’ a mental escape to sharpen the brain, increase knowledge, and flourish the imagination. Or ‘My vice is traveling,’ as it relaxes, soothes, and re-energizes. All of these are good. I believe there are bad, negative vices as there are good, positive vices. One is supported by weakness and dependency while the other by discipline and dedication. Breaking and ending a physical addiction and a psychological habit can be difficult, but it is achievable. Here are five suggested steps to help you override. Background. Do some soul searching and understand why and when you partake in your vice. What made you start and why it’s time to stop? Identify your triggers and associations. Remove any temptations from your home, car, and work. Find positive replacements and surround yourself with positive influences. Goal. Set a quit date within the next two weeks and get mentally prepared for your next chapter. Strategy. Create a plan of action with benchmarks and achievable goals. A good strategy will address the short–term challenge of quitting smoking and the long–term challenge of preventing a relapse. Alliances. Let your friends and family in on your plan and ask them for their support and encouragement to break your negative habit. Look for a “quit buddy” who wants to stop the same habit as well. You can help each other get through the rough times. If you believe it will help your journey, talk to your physician. He or she can prescribe medication to help with withdrawal and suggest other alternatives. Journey. Document your daily journey of struggles and wins. This will also help zero in on additional vice patterns while tracking your highs and lows. When you have a craving, include the intensity on a scale of 1-10 and what you did to overcome, such as types of distractions, embarking on a new hobby, or reminding yourself why you quit.